Saturday 7.45pm, sheltering gratefully from another bout of Edinburgh rain I shuffle and fidget a little as the butterflies in my stomach start to have their wicked way with me. Yes, a little crazy I admit but I always get like this in the run up to something special and as Fringe shows go it doesn’t get any more special than this. A buzz of expectancy works its way through the queue as seasoned admirers rub shoulders with would be new disciples, exchanging stories of previous show highlights and expectations of the night ahead. [Here is an appearance of Camille on the Jools Holland show]. 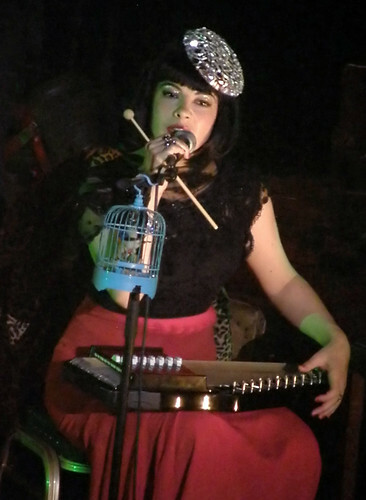 When Camille O’Sullivan comes to town people travel from far and wide and as I take my seat next to two charming American ladies, they can barely contain their excitement as they admit that this is a very much anticipated first opportunity to see her play. As the lights dim, Camille - clad from head to toe in a hooded crimson cloak – floats across a stage draped with fairy lights through an array of scattered treasures including an illuminated dolls house, a toy chest and a bird cage laid out beneath a collection of vintage dresses suspended from the ceiling. Arriving beneath a single spotlight she opens a large storybook and in a whispered vocal leads us towards the opening number of the evening – a full on version of The Arcade Fire’s “Wake Up”. As always, in the build up to Camille’s latest show, the first measure of enjoyment is in the anticipation as to which songs she has chosen to incorporate into her set and one thing of which you can be certain is that she will always have the courage and ability to choose those that would defeat lesser performers. This opener is normally brought to life by an eight piece stadium band packed with multi instrumentalists and the fact that Camille – ably assisted by her highly skilled, handpicked three piece – completely nail it, is a declaration of things to come. Changes of pace and style follow as a tender and fragile version of Josh Groban’s “Galilieo” is juxtaposed with a stridently manic version of Tiger Lillies “Crack of Doom”. Between songs Camille, shedding layers of her red costume and her black wig moves around the stage between her lovingly arranged trinkets, as hauntingly disembodied voices of children and sinister storybook characters swirl around our ears reinforcing the fairytale atmosphere. In previous shows “Dark Angel” and “Chameleon” – brilliant shows in their own right – Camille has employed a style that has seen her punctuate the drama of her musical numbers with much playful conversation and interaction between herself and the audience and although this is not completely removed from “Feel” it is greatly reduced and what we see tonight is the application of an altogether darker and tighter concept – one that for me served perfectly to sustain the intensity throughout. A red hot cover of “Sugar In My Bowl” is followed by “The Revelator”, a song that I had been greatly anticipating. In its original form it is a sad, gentle ballad delivered in the Southern drawl of one of my favourite singers Gillian Welch. Camille’s version delivered with a vocal cracking with raw emotion, is significantly different and every bit as wonderful. Given the choice, there is only one place to be at Camille’s shows and that is as close to the stage as possible as there is so much is to be gained from observing closely every gesture of emotion that dances across her stunning features. This is never truer than during “Amsterdam” – a song that she has thankfully chosen to revisit for her latest show. Covered brilliantly by musical legends such as David Bowie and Scott Walker – I still believe that composer Jacques Brel could never have envisaged anyone performing his song as perfectly as this. Gazing out through tear filled eyes she gives an unaccompanied performance that takes your breath away. By now she is completely in her stride and with songs such as Dylan’s “Simple Twist Of Fate”, Nine Inch Nails “Hurt” and Nick Cave’s “(Are You) The One I’ve Been Waiting For?” she has chosen a collective body of work driven by feelings of love, loss and heartbreak. 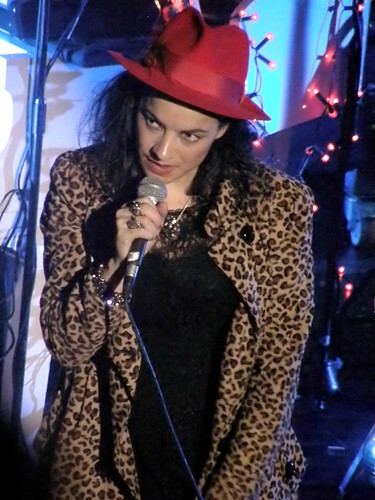 Many performers cover songs – Camille consumes them, allows them to burn inside her and thrusts them out on a tide of emotion and unique vocal delivery. The penultimate song and the second from the pen of Nick Cave is another staple of previous performances – her sublime version of “The Ship Song”. If this doesn’t send shivers then there really is no hope for you! The first of two standing ovations sees her return for a lovely treatment of Radiohead’s “Motion Picture Soundtrack” before the curtain finally falls. The only problem with a show like this is that it has to end. 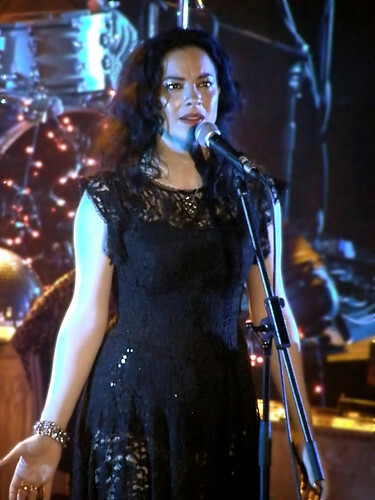 Of the many times that I have had the pleasure of watching Camille O’Sullivan perform I would have to say that this was my favourite and when Camille is on this form there is no one to touch her. It really doesn’t get any better than this.